Nobody knows when humans started dancing, but it must have been a very long time ago. It was probably a natural expression of joy or elation and I suspect many generations elapsed before the concept of ritual dancing emerged. But of course, all this is so far back in human history that we simply don’t know. Your guess it as good as mine and to be honest, probably better. We know that formalized dancing was practised among the ancient Greeks, because various artifacts depict dancers and musicians. Even so, we don’t know very much about what the music actually sounded like. It wasn’t until the Renaissance began to dawn, that an increasing amount of dance music was written down. Huge collections were produced during the second half of the sixteenth century onwards, notably by prolific composers like Michael Praetorius, Tielman Susato and publisher Pierre Phalèse. 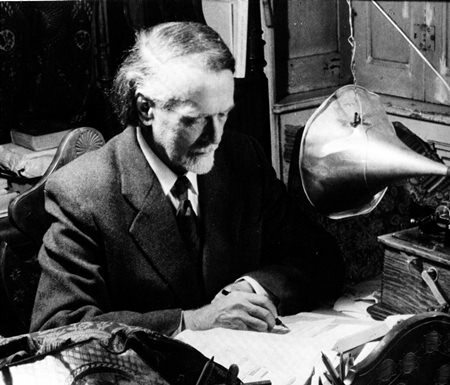 Zoltán Kodály analysing folk-song recordings. Leuven lies about sixteen miles east of Brussels and Pierre Phalèse started a bookselling business there, which developed into a successful publishing house. By 1575 he had produced nearly two hundred music books, many for the lute – a popular instrument for singing and dance music. At first, Phalèse outsourced his books to various printers, but later produced his own music books using state-of-the-art technology, movable type. During the sixteenth and seventh centuries, dance music of all forms flowed from the pens of many composers, including some distinguished ones like Bach, Handel, and Georg Philipp Telemann who wrote suites of dances, not necessarily for dancing but as courtly entertainment. Zoltán Kodály (zohl-TAHN koh-DAH-yee) is best known as the creator of the so-called Kodály Method. He became interested in children’s music education in 1925 when he happened to hear some school kids singing in the street. He was horrified by their tuneless squawking and drew the conclusion that music teaching in the schools was to blame. He set about a campaign for better teachers, a better curriculum, and more class-time devoted to music. His tireless work resulted in many publications which later influenced music education world-wide. Kodály is most closely associated with a teaching aid he didn’t actually invent: the hand signs. The so-called Kodály hand signs were devised in the mid-nineteenth century by an English minister, John Curwen and they represent each note of the scale. They were used in the 1977 movie Close Encounters of the Third Kind, but they didn’t seem to fit the plot and were perhaps merely included to add a bit of gravitas to a rather implausible scene. Kodály wrote Dances of Galánta in 1933 using folk music of the Galánta region, now part of Slovakia. The work is in five sections and the clarinet is especially prominent, because it represents the traditional Hungarian tárogató, a single reed instrument whose conical bore produces a unique sound, somewhere between that of an oboe and that of a soprano saxophone. Alberto Ginastera (jee-nah-STEHR-ah) is considered the most powerful voice in Argentine classical music. He studied at the conservatoire in Buenos Aires, and later with the American composer Aaron Copland. Ginastera’s music can be challenging, percussive, thrilling, thought-provoking and sometimes even downright scary. The thunderous last movement of the dramatic First Piano Concerto was brought to fame in 1973 when it was adapted by the rock group Emerson, Lake & Palmer. Ginastera even approved of the arrangement, which relied heavily on keyboards and synthesized percussion. Much of Ginastera’s music is nationalistic and draws on Argentine folk themes or other elements of traditional music. He greatly admired the fine Gaucho traditions and this is reflected in his 1942 one-act ballet Estancia (“The Ranch”). It’s a story about a city boy who falls for a rancher’s daughter, but the girl finds him weak and dull compared to the macho and intrepid Gauchos. Ginastera turned the ballet music into a delightful four-movement orchestral suite and if you haven’t heard Ginastera before, this is a great place to start. All the hallmarks of his style are there: his love of percussive sounds, his sparkling angular melodies and his tremendous sense of rhythm. You would need a heart of stone to not be moved by the dazzling last movement (at 09:04) which is an absolute “must hear”. The closing section (at 10:47) is thrilling, with cataclysmic percussion and brilliantly articulated playing. The Simon Bolivar Orchestra of Venezuela is the direct result of another dedicated music educator, José Antonio Abreu, who developed a music education programme in Venezuela known as El Sistema. This young Venezuelan orchestra is superb and the brilliant, musically-gifted conductor Gustavo Dudamel clearly enjoys every moment of this action-packed music.